A march and rally against President Trump's executive order on tightening immigration was held Saturday afternoon in Boston. Dozens of people turned out for the march which started at 1 p.m. at the Chinatown Gate where protesters then headed to the Statehouse. "They are vilifying immigrants," says Maria Sanchez of Cambridge. Organizers said the plan was to stand up against Trump's policies, which they feel are anti-immigrant and unconstitutional. One man from Mexico, who married an American woman, told NBC Boston that he just cancelled an upcoming vacation for fear that he would not be able to re-enter the United States. Boston Mayor Marty Walsh went on CNN Saturday morning to express his support for those who are in danger of being deported. "We we want to ensure that we are not admitting into our country the very threats our soldiers are fighting overseas," Walsh said. Walsh, at the rally today, said "There really is a way to deal with immigration and have lawmakers pass legislation I think what's being threatened now doesn't make sense we have people that are fearful we have young people that were born here, they're in fear their parents will be deported." In a press release Saturday evening the Mayor said "As Americans, we must move forward together as a country proud of our diverse heritage, and find real solutions to the challenges we face." On Friday, Trump signed an executive order that indefinitely suspends the United States' Syrian refugees program, temporarily halts all other refugee admissions and blocks immigration from some majority-Muslim countries with terrorism concerns. The President said the actions are aimed at keeping out what he calls "radical Islamic terrorists." Rep. Seth Moulton, who served four tours in Iraq, says he is ashamed Trump is the country's president. He says Trump's actions put U.S. troops at risk. Sen. Edward Markey says Trump's executive order is "more about extreme xenophobia than extreme vetting." At Saturday's rally, personal stories were told by migrants from Colombia, Guatemala, Costa Rica, Haiti, China and India. Speakers from various organizations like Standing Up for Racial Justice, International Socialist Organization, and Boston Labor Solidarity Committee were also in attendance. 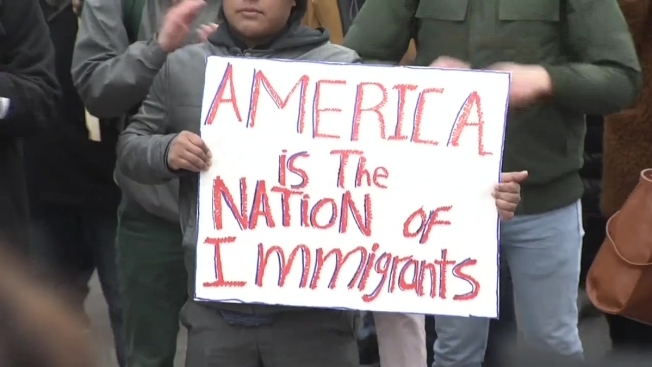 "I think it's unfair to pick on the most vulnerable in our society, I think immigration is a problem but we have to have a better solution," says Jose Jorge Mendoza, a professor at UMass Lowell. Former Green Party presidential candidate, Dr. Jill Stein, was also expected to speak on behalf of the Greater Boston Chapter of the Green Rainbow Party. Another rally focusing on the refugee ban is scheduled for 1 p.m. Sunday in Copley Square.